My NSERC program investigates the hormonal regulation of learning and memory. female rats differing in previous reproductive experience. examining the effects E to alter immediate early genes in the hippocampus after spatial memory retrievalMcClure et al., 2013. Collectively, we found that high systemic E impaired performance in hippocampus-dependent (spatial working/reference memory radial arm maze(RAM) Galea et al., 2001; Holmes et al., 2002; and contextual fear conditioning Barha et al., 2010), caudate-dependent (cued win-stay Galea et al., 2001), and amygdala-dependent (conditioned place preference Galea et al., 2001) tasks. This shows that E affects cognition in a number of brain areas. However lower E facilitated performance on hippocampus-dependent and PFC-dependent tasksBarha et al., 2010;Uban et al., 2012, Wide et al., 2004. Together we found that higher E impairs both working and reference memory, while lower E facilitates working, but not reference, memoryGalea et al., 2001; Holmes et al., 2002; Wide et al., 2004. This suggests a dissociation of E’s effects on working and reference memory processes. Intriguingly we have also found that E infused into either the dorsal hippocampus or PFC facilitated working memory in the delayed win-shift but at different dosesSinopoli et al.,2006 Therefore, the simple phrase “estrogen enhances learning” is not valid and our findings suggest a better description would be “estrogen modulates learning depending on dose and brain regions recruited”. In addition we found that high ovarian steroids are associated with spatial strategy useRummel et al.,2013 . Further our work suggests both genomic and non-genomic mechanisms are at play for E to affect mesolimbic-dependent decision making and hippocampus-dependent memoryBarha et al., 2010; Sinopoli et al., 2006; Uban et al., 2012; Wide et al., 2004. 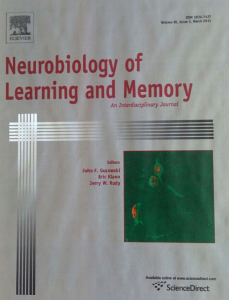 To examine neural correlates of E’s effects on learning we found that E upregulated the synaptic protein, synaptophysin in the CA3, but not CA1 or dentate gyrus (DG), region of the hippocampus Barha et al., 2010 and expression of the immediate early gene (IEG) product, zif268, in the ventral, but not dorsal, DGRummel et al., 2013with water maze training. Furthermore pilot data indicate that females and males show different expression patterns of IEG in the hippocampus and dorsomedial (DM) striatum (zif268/cfos) dependent on strategy useYagi et al., 2015. Our research has also tried to link spatial learning to neurogenesis in both males and females. We have found that although males show an upregulation in neurogenesis in the hippocampus in response to spatial performance (Morris Water Maze or Pattern Separation), females do not Chow et al.,2013;Yagi et al., 2015 . This upregulation in neurogenesis with spatial learning in males is dependent type of task, timing of task relative to maturation of new neurons, strain of rat and task difficulty Epp et al., 2007, 2010, 2011a,2011b; reviewed in Epp et al., 2013.